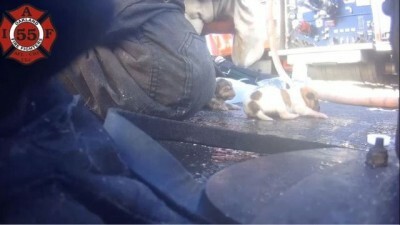 OAKLAND, Calif. (KTVU) - Oakland Firefighters rescued three puppies from a house fire in Oakland Friday. As crews conducted a search at the building on Bancroft and 108th Avenue they found a pet crate with three small puppies inside. Body cam footage shows the crew enter the structure that had a fire inside. Firefighters began giving the puppies water and oxygen with a pediatric mask. The three puppies survived the ordeal.